In a stratified society, the tiny fraction who comprise the ruling class must control perceptions of the much larger fraction under their control. To do so they must tightly manage the conduits of information and its interpretation through endlessly repeated story lines that alternately generate and relieve public anxiety. Driven by anxiety and reinforced by its reduction, we are herded along the path chosen by the rulers with only fleeting glimpses of reality. US news reports, invariably immersed in American mythology and disembodied from honest history, remain intentionally disinformative. There is no more glaring current example than the Iran nuclear issue, a red herring recognizable as such through examining our past and likely future relationships with Iran. Who should distrust whom? Who are the aggressors, who deserves international sanctions, who holds which cards, and what are the real stakes? For answers it helps to examine the historical trajectory within which today’s “news” about Iran is embedded. In 1953 the US overthrew Iran’s elected Prime Minister Mohammed Mossadeq and destroyed Iranian democracy to maintain Western control of Iran’s oil industry, then installed Shah Pahlavi and his brutal Savak-enforced police state for a quarter century as a bastion of US power in Central Asia until overthrown by a popular revolution in 1979. Given US stakes in control of the region, holding US embassy hostages seemed sensible at that time to discourage US military intervention, but the Iranian people have been punished by sanctions ever since including billions of dollars in frozen Iranian assets and a 40% reduction in Iranian oil exports. In 1980 the US encouraged and supported Iraq in launching and maintaining an 8-year war against Iran causing an estimated half-million Iranian deaths. Assuring sustained devastation to both sides, the US increased sanctions against Iran while duplicitously providing it secret arms using Israel as an intermediary with revenues diverted and laundered to support US atrocities in Central America. In 1988 shortly before a UN-brokered ceasefire, the USS Vincennes shot down Iran Air Flight 655 with two missiles, killing all 290 aboard including 66 children. Rather than disciplinary consequences, its Captain received the Legion of Merit, a neck decoration reserved for flag rank officers and second only to the Congressional Medal of Honor. Thus have we respected Iranian life. Iran is not an aggressor nation, having invaded no other country for over 200 years. US and Israeli intelligence services – supported by the IAEA – acknowledge that NPT-signatory Iran has no nuclear weapons program, and moreover, would pose no military threat even with nukes. They are neither crazy nor suicidal. In contrast, NPT non-signatory Israel has repeatedly attacked and occupied territories of all its contiguous neighbors throughout its brief 67-year history and is the only nuclear threat in the region with both land- and sea-based missile delivery systems. The US has completely destroyed two modern, advanced, secular, socialist Arab societies, has inflicted continuing chaos upon Afghanistan while restoring their opium production to assure continuing chaos in the West as well, and is covertly waging massive warfare against Syria and Yemen. Having identified the real aggressors, real victims and real threats, what then is the real agenda behind Israel’s hysterical demands for attack and our insistent sanctions upon Iran, both violating the UN Charter prohibiting “the threat or use of force against the territorial integrity or political independence of any state”? Wahhabist Saudi Arabia bitterly opposes Shia Iran as a regional hegemonic rival. It has made common cause with Israel, which wants to eliminate Iran’s support of Hezbollah, the defensive force against Israel’s 1982 invasion and 18-year occupation of south Lebanon that remains Lebanon’s bulwark against Israeli aggression. The Saudis have provided much of the funding and the Israel lobby has provided vigorous political pressure behind our proxy war against Syria, the key “Shia crescent” bridge between Iran and Hezbollah. But Israel and the Saudis aside, what independent US interests are involved? Russian and Chinese leaders seem to be implementing Brzezinski’s Grand Chessboard strategy more quietly and skillfully than the West. Sanctions against Iran have served a revitalized US cold war face-off against Russia, blocking Iran’s admission to the Shanghai Cooperation Organization which excludes membership to nations under UN sanctions. With India and Pakistan to become SCO members next year, inclusion of Iran would largely complete Russian-Asian dominance of central, southern and eastern Eurasia and encircle the resource-rich Caspian Basin. Iran applied for SCO membership in 2008 and will be eligible to join when UN sanctions are lifted, and the US can no longer block this. The SCO is a political, economic and military alliance that will soon represent about half the world’s population, intended to challenge the Bretton Woods financial institutions and reproduce the former Warsaw Pact’s counterweight to NATO. Chinese, Indian and Russian troops marched together in Moscow’s WWII victory parade this year. The SCO overlaps the three-continent BRICS alliance, which including Brazil in turn overlaps Latin American alliances of Mercosur, ALBA and UNASUR with its new Banco del Sur for development lending free of neoliberal “structural adjustments” imposed by the World Bank and IMF. Irrespective of congressional action on the agreement, the other P5+1 negotiating countries will not impose continuing sanctions. 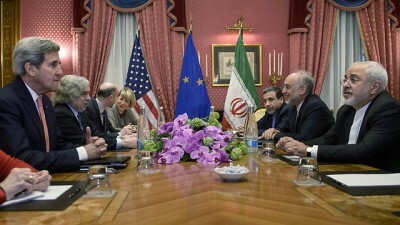 The EU is eager for Iranian natural gas. Iran and Russia together hold a third of the world’s natural gas reserves, to which the EU wants access. Force is not an option. Russia and Iran have already signed a major trade agreement and Russia will soon deliver them an S-300 surface-to-air anti-missile system, sufficient for effective defense against the US or Israel without needing to maintain ambiguity about a nuclear deterrent. Iran will also provide essential strategic land and sea links in China’s far-reaching New Silk Roads projects and is a founding member of the Asian Infrastructure Investment Bank for financing these projects. Chinese companies have already begun pumping from Iran’s immense gas fields in the Persian Gulf and oil fields along its border with Iraq, purchased in yuan and other alternative currencies to bypass Western sanctions. The Monroe Doctrine is finished and American power to control world resources is declining rapidly. Iran has refused to bend to our will, and the developing world is applauding. The 120-member Non-Aligned Movement chose Tehran for its 2015 conference and Iran is its current chair. We can either lose a decisive round or at least stay in the game. That, I believe, is what our acceptance of this accord will – at least for now – determine. Jack Dresser, Ph.D., a US Army psychologist during the Vietnam War and currently a retired behavioral scientist, is national vice-chair of the Veterans for Peace working group on Palestine and the Middle East, a member of the International Society of Political Psychology, and co-director of the Al-Nakba Awareness Project in Oregon that focuses on the Israeli land seizure, ethnic cleansing and occupation of Palestine.